A potential merger between Deutsche Bank AG and Commerzbank AG will not just change the way the two groups operate in the future; it will have wider implications on a national and a European level. Other banks, investors, staff, customers, taxpayers, the German government and domestic and EU regulators all have a stake in and will feel the effects of the biggest European bank merger since the financial crisis. For a long time, Christian Sewing, the CEO of Deutsche Bank, did not want to discuss a potential merger with Commerzbank as he wanted to focus on his own bank's restructuring. Deutsche's strategic revamp started by Sewing's predecessor, John Cryan, in late 2015 is expected to be largely complete by 2020. In early 2018, Sewing did not rule out a merger but needed around 18 months to work on the restructuring project before he could discuss any deal. However, a string of negative events such as a credit rating downgrade, poor stress test results in the U.S. and EU and several investigations into alleged money laundering increased pressure on Sewing and he eventually dropped his opposition against a potential merger. Commerzbank CEO Marting Zielke did not want to address the reports of a possible merger and also declined to comment for a while. He gave Commerzbank's own restructuring until the end of 2020. Zielke again declined to comment at Commerzbank's 2018 earnings presentation on Feb. 14. A month later, he was meeting with Sewing for official talks exploring merger options. Zielke promoted the deal to staff, saying it would give Commerzbank the scale it needs to hit growth and profitability goals sooner. Bloomberg reported April 4, citing an internal memo. Zielke is also seeking a quick decision on a potential merger as he faces mounting pressure after Commerzbank scrapped most of its medium-term performance goals and cut bonuses for 2018, Bloomberg said. Domestic and global peers are unlikely to worry about competition from a merged Deutsche-Commerzbank group over the next few years. Given that both banks' business models have been criticized and they are still in the midst of strategic restructuring, analysts believe they would struggle to boost profits even after a merger. The merged entity will be Europe's third-largest lender by total assets after HSBC and BNP Paribas. Although the German government believes this would give the new group a stronger footing to compete, analysts doubt the business mix will give it a big competitive edge over European and global peers. Commerzbank's key strength is German retail and small and medium-sized enterprise banking and most of Deutsche's earnings power still sits in its investment bank. Therefore, Commerzbank will not really boost Deutsche's ability to compete with large U.S. groups which are mostly focused on investment banking in Europe. In 2018, Commerzbank's retail and small business clients arm generated €4.8 billion and its midsize and large corporate clients business made €3.45 billion, out of total group revenue of €8.57 billion. Deutsche's corporate and investment bank accounted for €13 billion out of €25.3 billion in total group revenues in 2018. On the retail side, given that the bulk of both banks' operations are in Germany, other large European peers will not see stronger competition from a merged German group in their own markets. Deutsche and Commerzbank's home market is dominated by savings and cooperative banks, which combined capture more than 50% of the retail lending market and more than 60% of the corporate lending market, according to estimates of financial services consultancy Zeb. The domestic retail market share of the merged entity is therefore expected to stay in the teens, according to analysts. Research released March 17 by German financial sector consultancy Barkow Consulting, showed that private commercial banks as a whole accounted for only a 23% market share in terms of generated profits the German banking system in 2017, while savings and cooperative banks both held larger shares of 36% and 27%, respectively. A larger entity that has a chance of being more competitive internationally level and more profitable would be good news for investors. Cerberus Capital Management LP, a major investor in both Deutsche, with a 3% stake, and Commerzbank, with a 5% stake, has already said it was open to a deal in late February. However, the current, low market capitalization of both banks would likely dilute shareholder stakes further in case of a merger. Several other key investors have expressed reservations about the deal, according to media reports. Qatar, one of Deutsche Bank's top investors through its wealth fund, was the latest to signal opposition to a merger, citing stake dilution concerns, Bloomberg reported March 25. Retail customers might not feel the immediate effects of a merger. High branch overlap in urban areas means many customers are unlikely to be affected by a rationalization of the banks' networks. Corporate clients, especially large corporates, may be affected if they have running credits with Deutsche and Commerzbank. Given that this would be a cluster risk for the new entity, part of the credit lines may be reduced, Handelsblatt said March 24. Deutsche's head of transaction banking, Stefan Hoops, told the Financial Times in an April 1 interview he does not believe the overlap in corporate accounts is likely to affect the merged entity and clients are not expected to switch to other lenders due to cluster risks. A merged entity would be a potential risk for German taxpayers in these case of a failure or resolution. Regulators have already sounded warnings about that. Even though the EU's Bank Recovery and Resolution Directive could work in theory, there is still no guarantee that state money would not be necessary in resolving a too-big-to-fail entity. If a merged entity fails the German government would need to participate in its rescue, according to Rym Ayadi, a professor and chair of the European Banking Authority's Stakeholders Banking Group. If Deutsche alone were to fail, many investors fear it would be equivalent to a Lehman-like event for Europe, according to analysts. 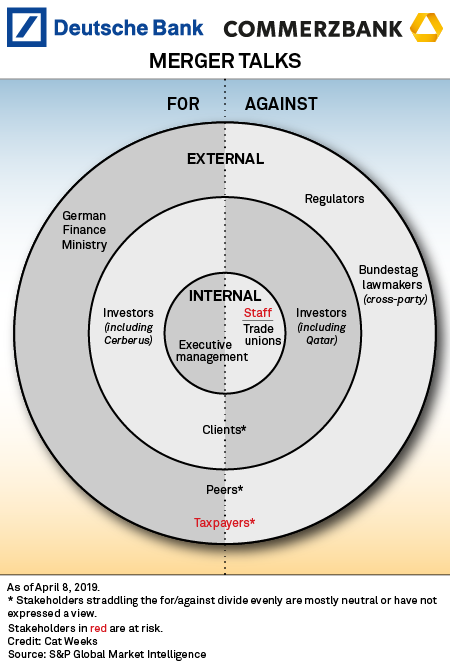 The new German cabinet has been pushing for more support for the financial services sector since early 2018. Finance Minister Olaf Scholz and his deputy, former Goldman Sachs banker Jörg Kukies, have called for stronger banks on numerous occasions. The government is seen as the driving force behind the arranged marriage of Deutsche and Commerzbank. However, politicians across all parties in the German parliament, most notably the Free Democratic Party, have criticized the state for being too close to the issue as it still is the largest shareholder in Commerzbank with a 15% stake. The Goldman Sachs connection of Kukies has also worried lawmakers as the U.S. group is advising Commerzbank on the potential merger. Kukies previously worked at Goldman's trading unit but this business was ring-fenced from the M&A advisory arm, a spokesman for the deputy finance minister told Reuters on March 18. Staff at the two banks have, so far, been the strongest opponents of a merger. Verdi, German's second-largest trade union, has warned 10,000 jobs could be lost over the short term and 30,000 over the long term. In a letter to the executive board March 27, Commerzbank's works council demanded that talks be broken off, warning that clients are already planning to leave the bank and there is no support for a deal. This followed a warning by Deutsche's works council that it would boycott labor talks for the integration of retail unit Postbank if merger negotiations with Commerzbank continue. Verdi, which has members on both banks' works councils and which sits on the supervisory boards of both banks, has also warned of a series of strikes against the merger. While trade unions cannot block a merger, in the past they have used nationwide strikes to put pressure on companies. Unions are likely to mount a campaign in the Deutsche and Commerzbank's case as well given the expected loss of jobs, Octavio Marenzi, CEO of investment firm Opimas, said. While regulators in Germany have largely remained neutral after Deutsche-Commerzbank merger talks began March 17, EU regulators have warned about systemic risks in case of a deal. Andrea Enria, the chair of the ECB's Single Supervisory Mechanism, said in a recent interview with the Financial Times that he does not like the idea of national or European champions. The Single Resolution Board echoed his remarks and added a merged entity will likely have to hold more capital to ensure it can bail itself in if it runs into trouble. Given that a Deutsche-Commerzbank merged entity will have a wider-spread business mix, and unlikely to capture a monopoly market share, it is thought it would gain antitrust approval from the Federal Cartel Office, or Bundeskartellamt, in Germany and from the European Commission. The surge in total assets to a combined €1.81 trillion will boost the merged group into a higher additional capital bucket. The buckets estimate the required level of additional common equity loss absorbency as a percentage of risk-weighted assets for global systemically important bankss. Deutsche is currently ranked in the 2% bucket with HSBC and Citigroup. JPMorgan is the only bank ranked higher, in the 2.5% bucket, while the highest, 3.5%, bucket is currently empty. Deutsche especially would need to provide regulators with a plan ensuring it will be able to raise the necessary additional loss-absorbing capital before getting a pass on the Commerzbank merger.